A recent scientific study has shown that a type of muscle stem cell called ‘satellite cells’ are essential for muscle fibre repair and replacement. Scientists had already identified several different types of muscle cell that can contribute to the formation of new muscle tissue. They are now investigating what exactly each of these cell types do and how they work. In this study, Ramkumar Sambasivan and colleagues at the Pasteur Institute in Paris discovered that when satellite cells were destroyed in mice, other types of cells were unable to repair muscle damage. This study tells us more about how different cell types work together to grow new muscle. It is hoped this knowledge can be used in the future to develop treatments for muscle wasting diseases including muscular dystrophy. Muscles of people with Duchenne muscular dystrophy can’t produce the muscle protein dystrophin, making them fragile and easily damaged. Their muscles can’t fully repair this damage leading to a loss of muscle tissue. In skeletal muscle there are various types of cells which are involved repairing muscle after injury, including a type called ‘satellite cells’. Scientists believe satellite cells are a type of muscle stem cell. They can form the many other muscle cell types that make up a working muscle, but can also copy themselves to ensure a reserve supply of satellite cells. 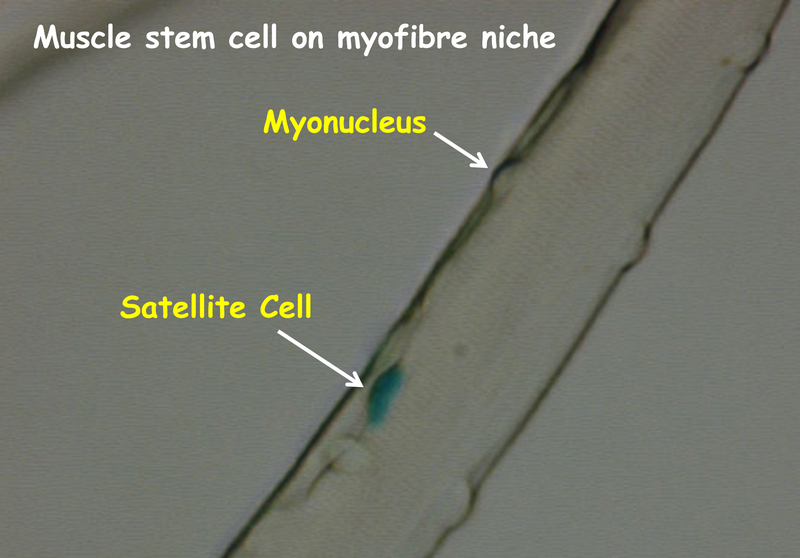 Satellite cells produce myoblasts which in turn fuse to produce new muscle fibres that comprise the contractile unit for skeletal muscle function. Distinguishing the satellite cells and their daughters which have a more restricted ability to self-renew themselves is currently challenging. For the first time in this study scientists found a way to look at the contribution of different types of cells by destroying only satellite cells in the leg muscle of mice. By removing satellite cells and looking at the impact this has on muscle repair scientists can build a picture of how exactly these different cells contribute to the process of muscle regeneration. Working with mice, scientists genetically altered a gene, called Pax7, which is unique to satellite cells. This caused satellite cells to die when a chemical called diphtheria toxin was injected into the muscle. First the scientists treated muscles only with diphtheria toxin and looked at them under the microscope. The muscle looked normal confirming that diphtheria toxin only killed satellite cells and didn’t affect other muscle cells appreciably. Scientists also found that after diphtheria toxin injection the amount of muscle tissue decreased somewhat over time, but the that the effects on differentiated muscle cells was not significant in the short term. Next they looked at the effect of damaging the muscles in the mice which no longer had any satellite cells. They did this by either injecting a chemical known to destroy muscle tissue or by making the mice exercise. In both cases the muscle did not repair itself despite the fact that other types of repair cells were still present. This suggests that satellite cells play a vital role in muscle regeneration. Finally, to show that the effect observed was specific to satellite cells, the researchers transplanted only the satellite cells from normal mice into mice with no satellite cells. The mice regained the ability to repair their muscles after injury and their muscle mass increased, proving that satellite cells are needed for muscle regeneration to take place. This study has significantly added to the picture scientists have of how muscle regeneration works and the importance of satellite cells to that process. An important outcome of this study is that for the first time scientists have been able to selectively destroy only a particular type of muscle cell. Now that they know how to do this it provides a useful experimental model which can be used to study the role of other cell types in muscle regeneration. For example, this model could be used to study the possibility of transplanting different types of muscle stem cells to treat Duchenne muscular dystrophy. Scientists hope that understanding how healthy muscle repairs itself will help them to understand why this repair process fails in the muscles of Duchenne muscular dystrophy patients. Then they can explore how to restart the repair process to reverse muscle wastage. However, there is still much work to be done before these discoveries in the lab can be translated into potential treatments. This study was carried out using mice and it is not known whether these results will also apply to humans. Also, further work is needed to investigate the role that the other types of repair cells play in muscles. Researchers need to understand how these other cells work with satellite cells to repair muscles and how this process is controlled. The full original paper was published in the journal Development in 2011.